I THINK IT'S A..... OR MAYBE A.....OR PERHAPS A...!! There are several plants in my garden that I like very much but have no idea what they are, apart from conifer, evergreen, etc. I have listed one in the question section but thought it might be simpler to do them all at once in a blog. 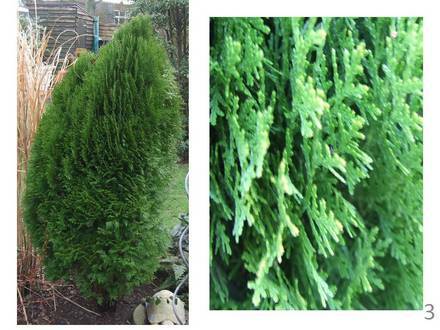 The first is the evergreen already listed – I have included a close up of a leaf and a better (hopefully) picture. The leaves are quite thick and a lighter green on the reverse side. The plant has been in my garden for about 9 years and was one of many given to me by a dear friend. It’s about 5 foot tall now. It was just a baby when I planted it. 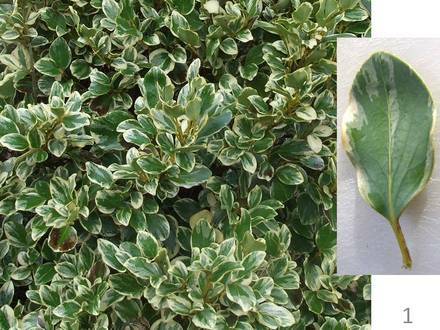 This second variegated evergreen is probably one of the Euonymous group. It is quite a bright green and yellow, compared to the first plant. Again, it was given to me by my friend. I prune this one regularly to keep it in shape otherwise it grows huge. Plant 3 came from the same friend. It is a little lopsided because the Ceonothus cuddled up too closely to it! That was cut back some time ago and gradually the little confier is recoving its shape. Its about 5 foot tall. 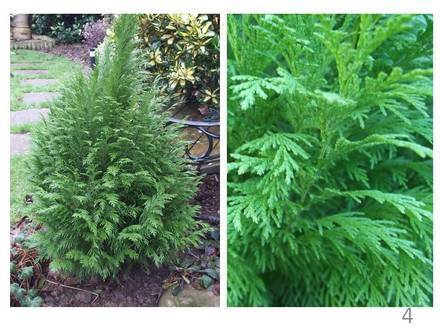 Plant 4 – this little conifer was purchased as a job lot from the local garden centre, 4 plants in a tray – nothing named but I liked them. Two did not survive! It’s a very tactile plant, very feathery looking. Planted about 3 years ago and has probably doubled in size, about 2 foot tall now. Plant 5 – Very small variegated plant. Only about 3-4 inches high but has spread a little. Has been in the garden for about 7-8 years and marks the grave of my two little chinchillas. Very, very slow growing. Plant 6 – This looks very similar to no. 5 but is a bigger plant, much more upright and I prune it into shape every couple of years. I suspect this is another of the euonymous family! (Perhaps all these variegated ones are?). Both 5 and 6 came from my lovely friend too – my garden would be empty without her donations. Another conifer, part of the job lot. This is much slower growing and slimmer, stands about 18 inches high now. It is a nice blue-green colour. Previous post: Get out of my garden! I still think that number 1 is an Eleagnus - probably E. pungens 'Variegata'. 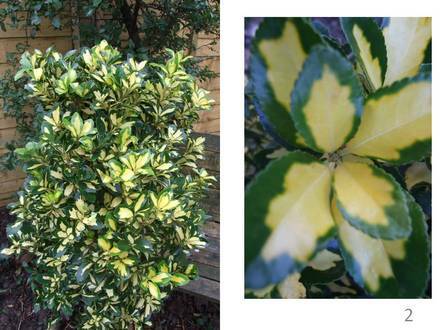 I reckon number 2 could be Euonymus japonicus 'Aureus'. I am hopeless on conifers, so can't even guess at nos. 3, 4 or 7. 6 probably is Euonymus fortunei 'Silver Queen', although I do have some doubts as it looks different to mine - the variegation looks very regular in the photo. Are the leaves of no.5 smaller than 6? They look like it - but you could be right, you've got them to compare, after all, they could be the same shrub. Well, I had a go for you, Gee! Thank you for your help. I have just posted a photo of what I believe to be a Silver Queen and it does seem different from No. 6. I am quite intriqued by the similarities and differences between these plants now and will check out nos. 5 and 6 again tomorrow, looking a bit more closely! I took a look, and that taller one looks more like a 'Silver Queen', Gee. That doesn't help to ID number 6, though! I think we are right that it IS a Euonymus fortunei, though. Just which cultivar is hard to say, though. 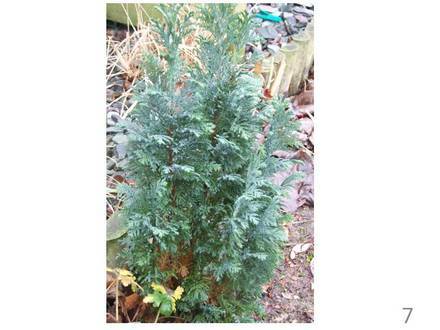 From your photos Gee, I think the first two conifers are some type of cedar and the last one is a type of juniper. I could very well be wrong and I don't know what type they are but its a start. I think that no. 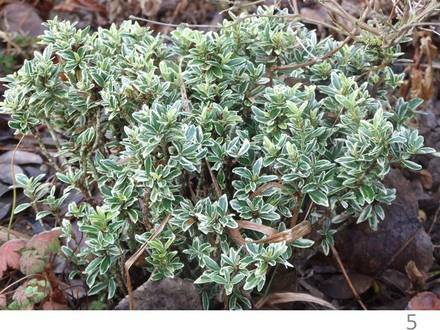 5 may be Euonumus japonicus 'Microphyllus Albovariegatus'..What a a long name for a small plant, Gee! Check it out. 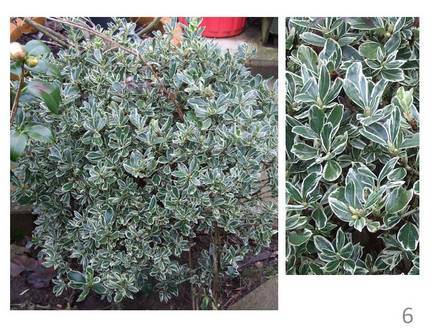 I also had an idea for no 6 - could it possibly be Rhamnus alaternus 'Variegata' ? Described as grey-green leaves with white margins. I have seen one and thought it COULD be. You've gone along the same route as me, Spritz. I found microphyllus etc on the web images page and thought it looked about right. I hadn't found anything for No 6 though. I've just looked on the web again and I think you might be right, looks very much the same. I have never noticed any flowers on it and have never had red berries but everything else checks out. The leaves of the two plants are very much the same, apart from size, microphyllus leaves are about half the size of the other. You are very welcome! I did a very, very naughty and awful thing for you, Gee. (whispers) I brought a plant label home because I didn't have anything to write the long name on and I definitely couldn't remember that lot! It's OK - the pot was well-labelled! Don't worry, Spritz, I won't tell anyone! Thanks for this Gee, because it helps me identify some of my own shrubs. And well done, Spritz and Gilli on a lot of the ID work. Bringing a plant label home ? nooooooooooo. Well, I did go back and buy the plant - I already had the label, so I had to really, didn't I?